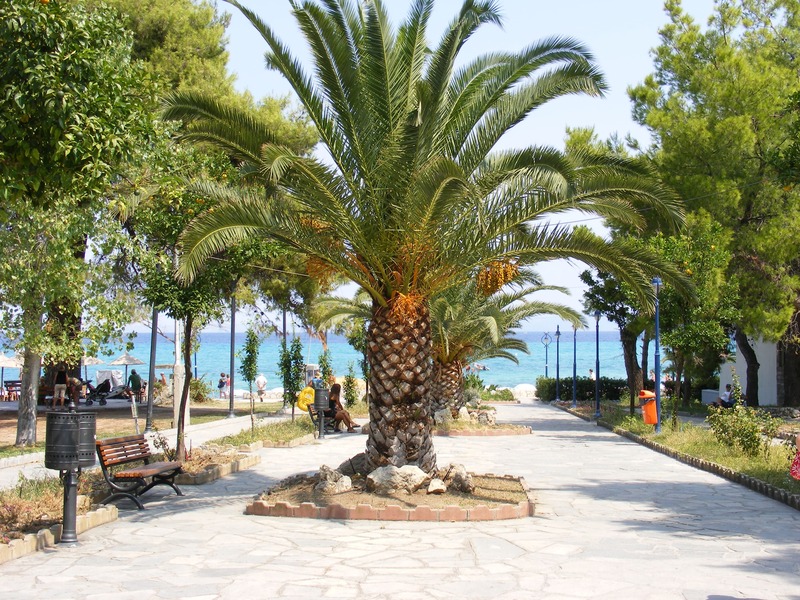 The peninsula of Halkidiki is part of Macedonia in North Greece. The peninsula is divided in Kassandra, Sithonia and Athos. Hanioti is a picturesque village but also a cosmopolitan resort with vibrant nightlife. It is situated in the peninsulas first “leg” Kassandra,, a 60 minute drive from Thessaloniki, the capital of North Greece. From the first moment the visitor will be captivated by the harmonious combination of modern facilities and traditional architecture houses, crystal clear blue waters and hills covered by mediterranean plants and olive trees. The sandy beach is ideal for swimming, sunbathing and water sports, awarded with ECC blue flag. The village itself has a great number of restaurant, bars, taverns and shops for all tastes and needs. Some of them surround the central square of the village when others are “hidden” in stone-paved streets waiting for the guest to explore them.